Record-keeping is an important part of archeological field work. Here, field crew members document soil colors at the 2013 Society Training Program. Recent archeological investigations in the Ouachita Mountains are revealing new information about American Indian history in Arkansas. 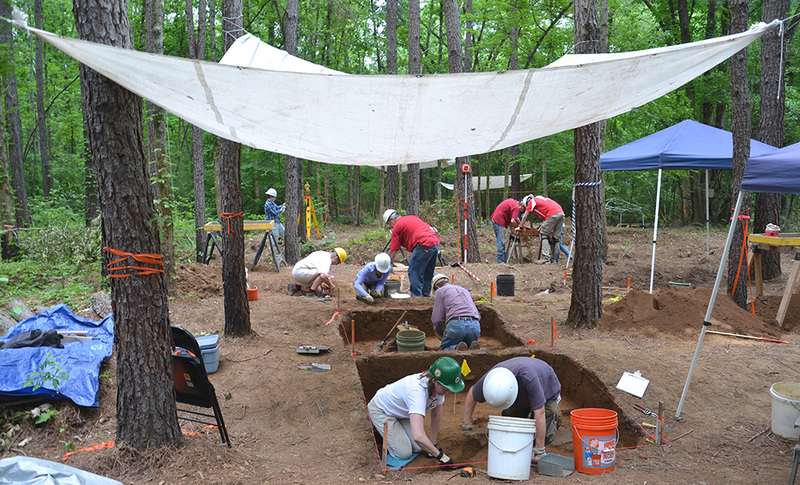 Excavations in 2013 and 2014 took place at site 3MN298 along the Ouachita River in the Ouachita National Forest. 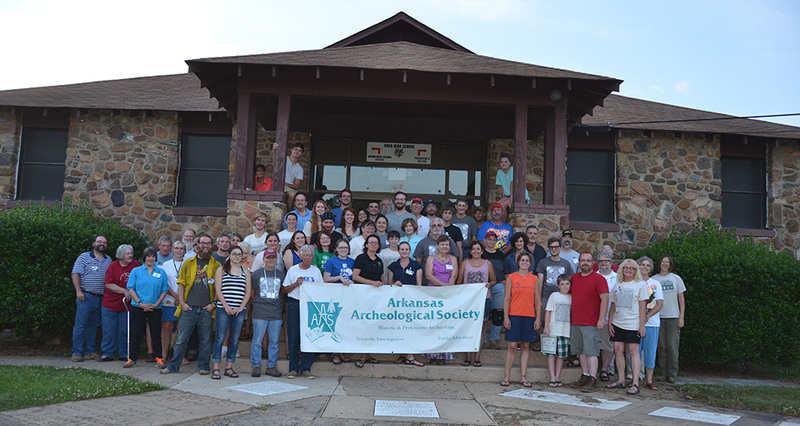 This cooperative project brings together numerous people from the Arkansas Archeological Survey, the U.S.D.A. Forest Service, and the Arkansas Archeological Society. The excavations were part of annual Society/Survey Training Programs, co-directed by Mary Beth Trubitt from the Arkansas Archeological Survey and Meeks Etchieson from the Ouachita National Forest. Excavations underway at 3MN298 during the 2013 Society Training Program. The site is large – about 25 acres – and has evidence of human habitation and use from at least the Middle Archaic period (about 6000 BC) to recent times (AD 1900s). Cultural features such as clusters of fire-cracked rock that represent dismantled cooking facilities, trash-filled pits, fire pits or hearths, and lines of postmolds indicating house walls were identified in six of the seven excavation areas. Few ordinary houses have been excavated at non-mound Caddo sites in this region, so our 3MN298 examples are important. 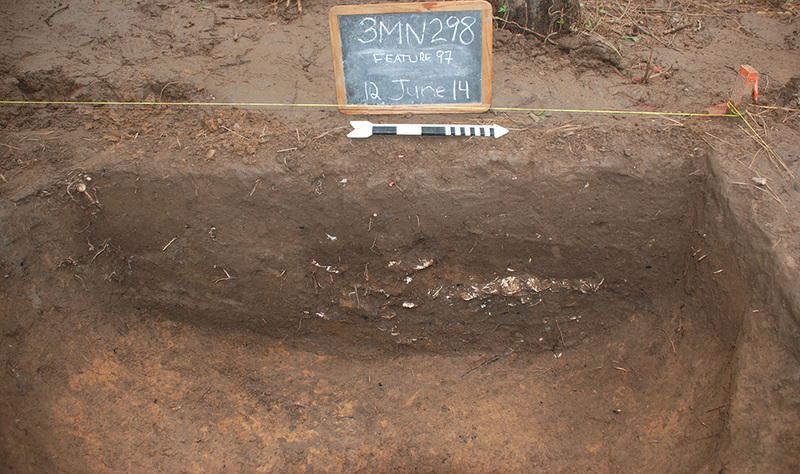 Large pits were excavated in several areas of the site, yielding new information about Caddo Indian foodways in the Ouachita Mountains during the Mississippian period. Food is especially important in cultural identity. The Caddo Indians who lived here were farmers who also gathered wild plants, fished in the Ouachita River, and hunted. Our project archaeobotanist and zooarcheologist have identified domesticated plants including maize, squash or gourd, and a bean, and the bones of deer, squirrel, opossum, fish, turtles, and turkey bones from a large pit excavated from one area. This corn cob fragment was preserved by charring. 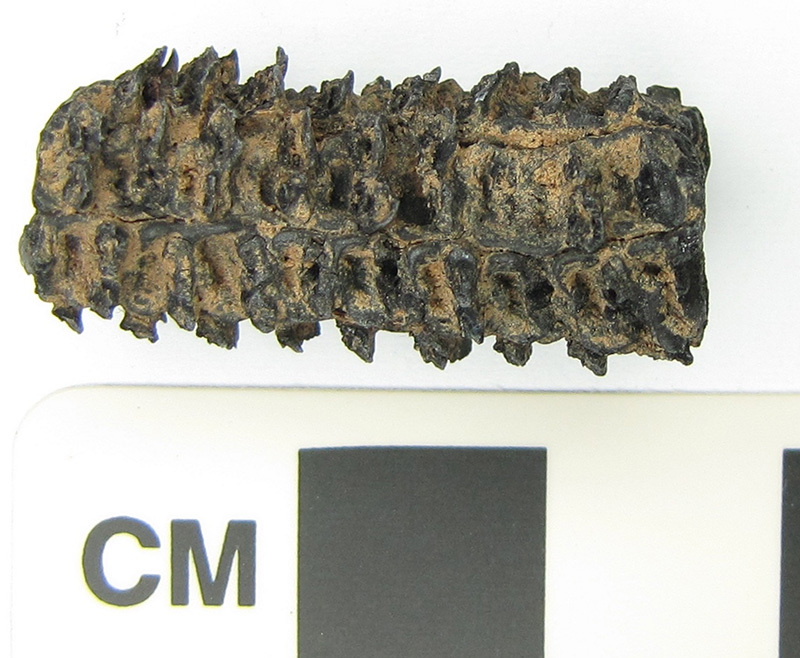 Domesticated maize/corn was identified by archeobotanist Leslie Bush in many of the samples she examined from Mississippian period features at the site. Photo: Leslie Bush. Soil from excavated features bagged for flotation. Pit feature F-97 had well-preserved animal bone and mussel shell, as seen in this profile view. 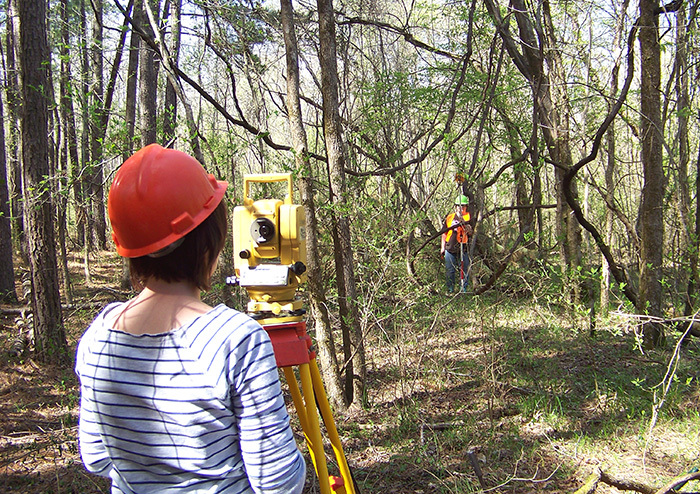 Henderson State University students learned total station mapping at the site during preparations for the 2013 Society Training Program at 3MN298. Our analysis of excavation results and our research into social identity in the Ouachita Mountains is still under way. The site is clearly significant, both because of the density of cultural features and architectural evidence, and because of the unusual preservation of plant and animal residues that give us evidence of foodways and refuse disposal patterns. We now have confirmation that Indians were farming at this location on the Upper Ouachita River, and that they lived here both before and after the Spanish expedition led by Hernando de Soto passed through Arkansas between 1541 and 1543. The Ouachita Mountains region was not abandoned after the Spanish incursion; instead, the community at 3MN298 continued on until at least the mid-1600s. 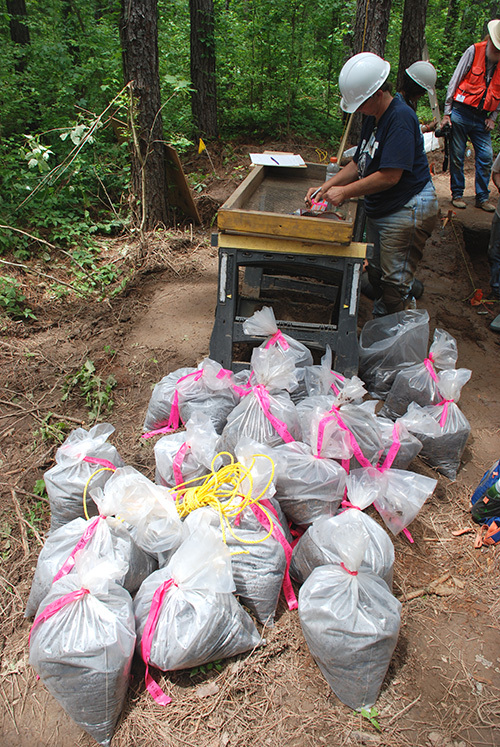 Arkansas Archeological Survey and Ouachita National Forest archeologists have been assisted by numerous volunteers from the Arkansas Archeological Society and from Henderson State University working on this project in the field and lab. Funding for specialized analyses comes from the U.S.D.A. Forest Service, the Arkansas Archeological Society Archeological Research Fund, the Ouachita Chapter, the Department of Arkansas Heritage, and the University of Missouri Research Reactor Center’s Archaeometry Laboratory. Thanks to all! 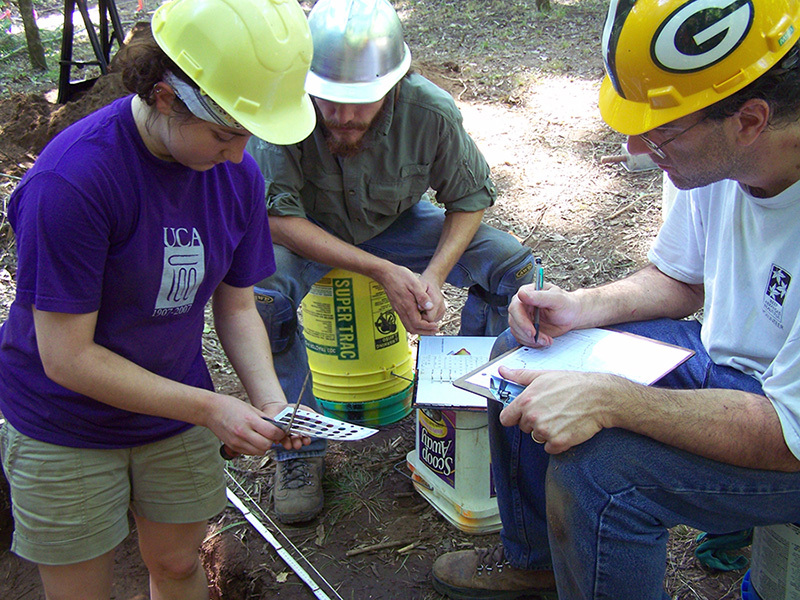 The 2013-2014 Society Training Program excavations in the Ouachita National Forest involved many people – professionals and volunteers – working together. Etchieson, Meeks and Mary Beth Trubitt (2013) Plans for the 50th Arkansas Archeological Society Training Program. Field Notes, Newsletter of the Arkansas Archeological Society 371:3-8. Ouachita Chapter, Arkansas Archeological Society (2014) What’s for Supper? Native American Foods in the Ouachita Mountains. Children’s book, funded by the Department of Arkansas Heritage, distributed to elementary schools in Garland, Hot Spring, Montgomery, Pike, and Polk counties in Arkansas. Trubitt, Mary Beth and Meeks Etchieson (2014) Plans for the 2014 Arkansas Archeological Society Training Program in the Ouachita National Forest. Field Notes, Newsletter of the Arkansas Archeological Society 377:3-5. Trubitt, Mary Beth, Meeks Etchieson, and Leslie L. Bush (2014) First Results from 3MN298: The Caddo Community. Field Notes, Newsletter of the Arkansas Archeological Society 377:10-14. Trubitt, Mary Beth and Katie Leslie (2016) 2013-2014 Society Training Program Excavations: The Dates. Field Notes, Newsletter of the Arkansas Archeological Society 390:6-14.